Diploma, the right choice to utilize the skills and the beginning of a Research aptitude and a growing career. 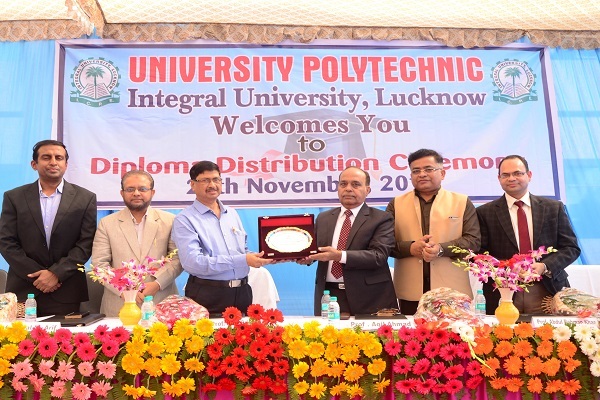 University Polytechnic, Integral University Lucknow, organized its Diploma Distribution Ceremony on Nov 29, 2018, at University Polytechnic campus, Integral Lucknow. About 300 students from various branches of Diploma in the fields of Engineering- Mechanical, Electrical, Computer science, Civil, Automobile, and Architecture were awarded gold, silver medals & the customary Diploma certificate. Prof. Santosh Kumar Srivastava (Emeritus Scientist), Head of Chemical Science at the Council of Scientific and Industrial Research- Central Institute of Medicinal and Aromatic Plants, (CSIR-CMAP) was the chief guest of the event. 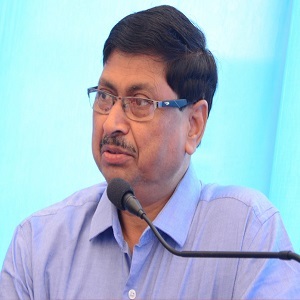 He expressed his delight towards the University Polytechnic being focused in offering programs and conducting research related areas of various engineering fields and its endeavor in offering equal opportunities to students from humble backgrounds and uplifting their spirits and stature by providing quality education. He said that punctuality, perseverance, and dedications are the keys to achieve anything and Diploma is the beginning of a Research aptitude and a growing career. 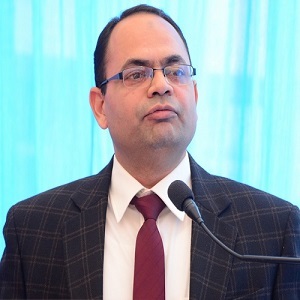 “This is the Fifth batch of qualified students from our institution in Lucknow and Shahjahanapur, being conferred with the diploma certificates today, many pass-out students already being working in the various sectors across the country” informed Dr. Khwaja Moeed, Principal University, Polytechnic, Integral. 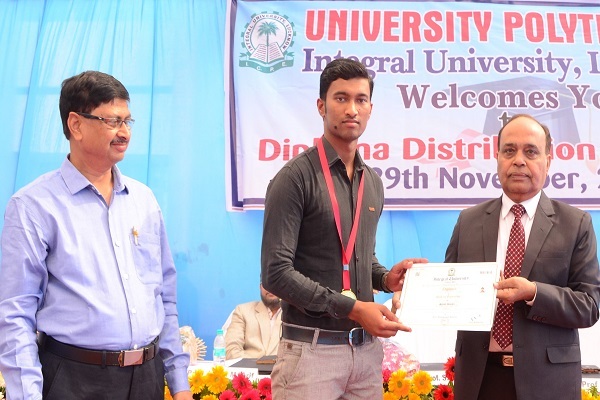 He further mentioned that the Gold medalist, Sajid Ansari, from the Electrical engineering department, with his exemplary performance, is the Polytechnic topper this year with 94.8%. Tausif Asif- Mechanical Engineering, Mohd. Shahzad Ansari- Civil Engg, Ishtiyak -Electronic, Mohd. Saif Siddiqui- Automobile, and Anil Kumar Sharma- Architecture have all with their dedication have topped their department” he added. The distribution Ceremony was presided over by Prof. Aqil Ahmad, Vice-Chancellor (acting), Integral University Lucknow. “With the right qualifications, these students will be able to plan their career choices and utilize their skills. In many cases, a diploma is the best answer: it comes at a fraction of the cost, time and effort, and equips students with better practical skills and confidence for a new career.” He said while addressing the students and their parents, hopeful for a bright future. “Many could be finishing their secondary schooling and looking for the first logical step in their career journey, Or, some might be a seasoned professional deciding to take a new career path, If you are choosing to further your study, you will most likely be a motivated person and will do well in your career regardless. 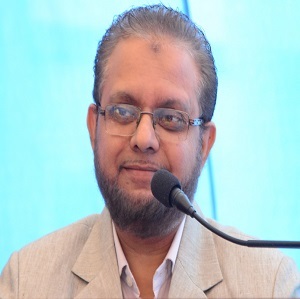 Diploma, Vocational Courses, equips an individual with better practical skills and conf idence for a new career,” enlightened Prof Jamal Arif, Dean, Academic Affairs. Prof Syed Aqeel Ahmad, Deputy Controller of Examination, Integral, wished the proud parents present in the audience that their wards have begun a competent journey that would result in the desired destination. He cited the living examples of famous powerful men who pursued diploma to begin their glorious career. The event concluded with the National Anthem and distribution of the medals and certificates to the gold and silver medal achievers, and paved way for the new batches to be dedicated and honest in their course of study.